The Holy Scripture is the only sufficient, certain, and infallible rule of all saving knowledge, faith, and obedience, although the light of nature, and the works of creation and providence do so far manifest the goodness, wisdom, and power of God, as to leave men inexcusable; yet are they not sufficient to give that knowledge of God and his will which is necessary unto salvation. Therefore it pleased the Lord at sundry times and in divers manners to reveal himself, and to declare that his will unto his church; and afterward for the better preserving and propagating of the truth, and for the more sure establishment and comfort of the church against the corruption of the flesh, and the malice of Satan, and of the world, to commit the same wholly unto writing; which maketh the Holy Scriptures to be most necessary, those former ways of God’s revealing his will unto his people being now ceased. White (whether sadly or laughably might be best used here, I cannot determine) claimed that Michael Brown held to the Sufficiency of Scripture in his now-infamous “orthodoxy checklist.” Brown – and I don’t need to belabor the point here – believes in Sneaky Squid Spirits, ecstatic utterance (which by its definition is prophetic), relevatory dreams and visions, and then defends the most extreme false prophets in the world. There is no hyperbole in that statement; Brown defends the – literally – most extreme false prophets in the world, including Bill Johnson, Kris Vollotton, Kenneth Copeland, Todd White, Jennifer LeClaire and Benny Hinn. He defends the so-called “glory clouds.” But it’s not just that Brown defends the hyper-charismatic; Brown himself is hyper-charismatic. He has repeatedly claimed the most fantastical tales of his own, regaling his listening audience with his own prophetic and apostolic power. In James White’s defense of the indefensible, many Christian leaders (most of who have been friends of White) have tried to warn people that Michael Brown is not commendable, while yet tip-toeing around White’s endorsement, lest they poke the bear. While Pulpit & Pen has been rather direct regarding White’s 2nd John sin of endorsing and promoting (in every definition of the words, that’s exactly what White has done) Brown, others like Justin Peters, Phil Johnson, Todd Friel and Chris Rosebrough have been more tactful and less direct regarding White; while warning about Brown, they’ve tried not to bring up James White at all, probably out of deference and respect to his body of work. This kindness on the part of Peters, Johnson, Friel and Rosebrough has not bought any grace on the part of White, who has chosen to go out of his way to attack them for criticizing Brown and in the process, attack the field of polemics and discernment. This is sad, considering James White himself does polemics and discernment, but only fails in the case of Brown to do it consistently. 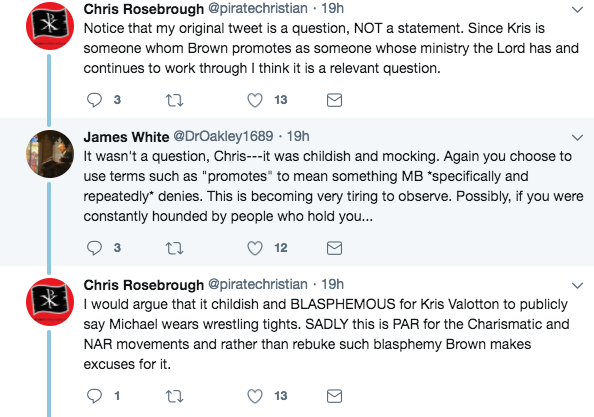 Chris Rosebrough of Fighting for the Faith and Pirate Christian Radio has been at the forefront of exposing Brown for years, and has also been friendly with White for some time. Yesterday, Rosebrough sent the following tweet. Now keep in mind, Rosebrough was doing what Rosebrough has been doing for many years – years during which he and White remained friends – which was to point out the absurdity of the NAR movement and to goad Michael Brown into showing his true colors. Of course, Michael Brown has repeatedly defended the craziest of charismatic wackiness, and so there was little to zero chance Brown would respond other than to launch an ad hominem toward Rosebrough. Nonetheless, Rosebrough compiles the evidence and let’s anyone with a modicum of common sense determine the truth. Now watch and pay attention; Rosebrough didn’t mention White. He wasn’t attacking White. He wasn’t referencing White. However, the megalomaniacal instinct of James White simply cannot allow anyone of noteriety demonstrate his own failure in discernment. There is no room in James White’s universe (the color of the sky in such a place, we are unaware) for someone – anyone – and anywhere to challenge him, even indirectly. James White has vouched for the orthodox credentials of who is among the most extreme of charismatics, and the entire world is supposed to take that endorsement as pure gold. So, even though Rosebrough didn’t address White, White came to the rescue of Michael Brown, just as he did when Michael Brown recently said that the Oneness debate was among Christians. James White’s tweet makes no sense whatsoever. Kris Vallotton is Bill Johnson’s protege at Bethel Redding. Michael Brown vouched for Bill Johnson and said he was a solid Christian brother ON THE DIVIDING LINE WITH JAMES WHITE. Is it not reasonable to ask Michael Brown whether or not he agrees with the one Brown endorsed on White’s own “Reformed” webcast? James White has been saying this “friends doesn’t equal endorsement” thing long enough, we’re going to have to start accusing him of being a liar. James White knows better. He knows very well that no one – absolutely NO ONE – is upset that James White is “friends” with Michael Brown or that Michael Brown is “friends” with notorious scoundrels and heretics. We could accuse White of being stupid rather than being a liar, but it’s highly doubtful that White is stupid. Unfortunately, this leaves us questioning his moral qualifications rather than his mental qualifications for the work of an elder. We all acknowledge that Jesus was a friend of whores and drunks, and there’s nothing wrong with being friends with virtually anyone, so long as it’s not in a James 4:4 type of way. Rather, everyone has been very clear from the beginning, the problem is that White has ENDORSED and COMMENDED Michael Brown (as in, “read his books, listen to him, he’s a solid brother”) in the same way that Brown has ENDORSED and COMMENDED Benny Hinn, Bill Johnson, Kris Vallotton, Kenneth Copeland and Todd White. And although there are video clips of Brown saying he hasn’t endorsed these false teachers, we and Rosebrough and many others have produced other video clips or books excerpts where he certainly has. Some people need to realize that facts don’t change just because James White is nosediving the crediblity of his ministry. Here, James White oozes pride like a pimple oozes puss. He claims that what Rosebrough produces is nothing of “dust” and produces nothing of value. He guilt-shames Rosebrough for taking a false teacher’s public words and providing citation of him saying it – on video – and claims that to do so is “childish and mocking.” Again, White refuses to acknowledge the evidence Rosebrough has produced of straight-up, no-questions-asked, hard-core PROMOTION of these false teachers. On this point, White has been incorrigible and uncorrectable. Of course, Rosebrough does not promote and endorse any of the ungodless paganism of the ELCA in the same way that Michael Brown promotes and endorses (in every meaning and definition of those words) the worst false teachers in the charismatic movement. 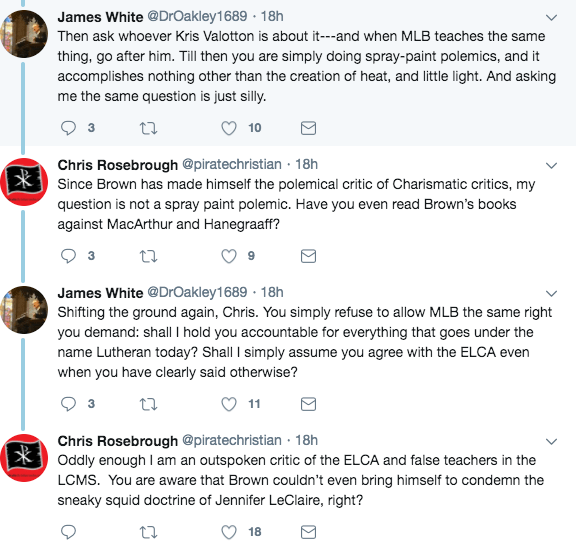 James White is not only viciously attacking good, honest and CONSISTENT men like Chris Rosebrough, he’s attacking the field of polemics and discernment, apparently blissfully unaware that he’s been doing polemics and discernment for the bulk of his ministry. It’s only that lately he’s been doing it very, very poorly.